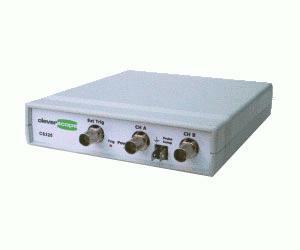 Cleverscope Model CS320 is a USB connected, PC hosted oscilloscope and spectrum analyser with PC based application software. Two 10 bit analog channels sampling simultaneously at 100 MSa/sec. AC or DC coupled. Each channel (two analog and trigger ) includes 4M samples of storage, providing 40 ms of simultaneous storage for all channels, with 10 ns resolution. The sample storage may be allocated as between 2 to 1000 frames varying in size from 2M to 4000 samples. These may be used as a history store for reviewing previously captured signals, or to capture up to 1000 trigger events with a minimal 2 µs inter-frame delay, while maintaining time relative to the first trigger for all succeeding frames. 25 MHz 5th order Anti-alias filter for improved Spectrum Analysis performance.